In 2003, at the age of 6, I was admitted to the primary school (or known as "elementary school" in some countries). Primary school is known as sekolah rendah in Malay, which carries meaning of "short school". Do note that rendah means "short in terms of height", and another word pendek means "short in terms of length". The school I attend to, SJK(C)Chung Hwa Sungai Lalang, Kedah (吉打州双溪拉兰中华学校) is a Chinese national-type primary school which uses Chinese as the main language. The school's official code is KBC3061. Most of the subjects were taught in Chinese. I get a new Chinese name in primary school, still Xi Daya but with a different characters: 喜达亚 which I stick to use until now. Image from Google Map Streetview, © Google, Inc. In primary school, I was introduced to a new language, English. English is then became my third language. The school taught English because it is a part of the national curriculum standard. 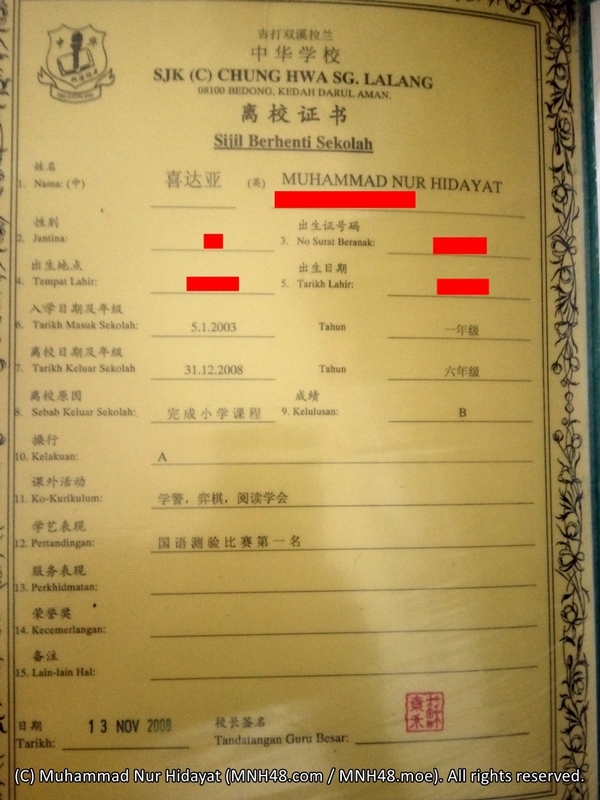 Furthermore, the time I was admitted to primary school is also the first year of implementing a new programme by Malaysian Ministry of Education called "The Teaching and Learning of Science and Mathematics in English" or known in Malay as Pengajaran dan Pembelajaran Sains dan Matematik dalam bahasa Inggeris (PPSMI). Due to some controversional issue, Chinese schools teach both English and Chinese variant of both Mathematics and Science, and cramped our class timetable thus doubled our homeworks. In those days, there were either two or three classes for each year, they are K (yellow-tagged) and M (red-tagged) classes, occasionally there are H (green-tagged) classes. In early two years, the class are assigned randomly. After that, the class are assigned based on performance from previous years, students performed well is placed in M class, followed by K class and occasionally H class. My classes were 1K, 2K, 3M, 4M, 5M and 6M. I don't have a digital copy of the timetables from these days, but I'm writing the subjects I learnt as far as what I could remember. All subjects taught in Chinese unless stated. As for the co-curricular activities, I was in the Tunas KRS (学警) uniformed body, chess club (弈棋), and reading society (阅读学会). While I was in Tunas KRS, I learnt the basics of scouting and camping, also skills necessary for survival. However, I didn't join the camping because it needs parent approval and my parents doesn't approve me joining it. In the chess club, we actually play many different kinds of chess which include the local draught "Dam Haji" (跳棋), the English Chess (国际象棋), the Chinese Chess (中国象棋), and shogi (将棋). As for reading society, I was able to join it because I regularly borrow books from the school library and write book summaries under the Nilam Reading Programme. 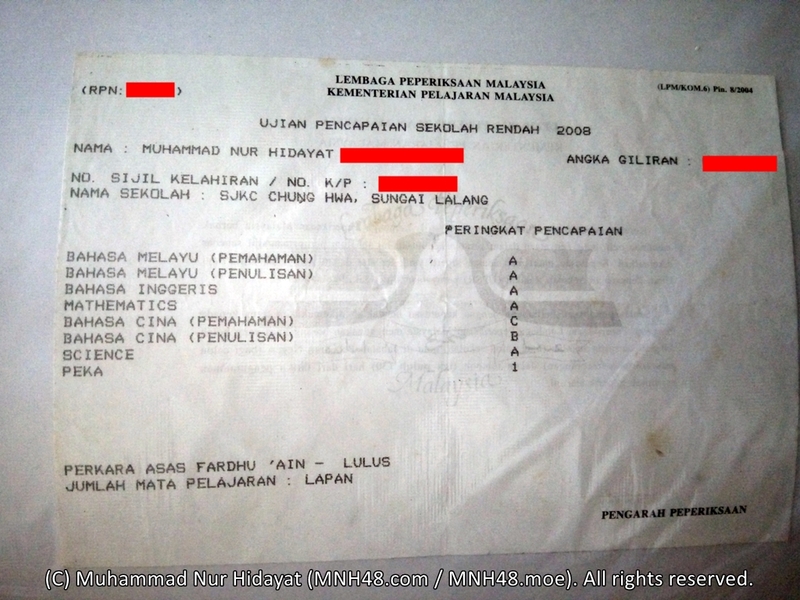 At the end of year 6 in 2008, I sat for the first national examination, which is called Primary School Evaluation Test or Ujian Penilaian Sekolah Rendah (UPSR) taking 7 subjects: Malay Comprehension, Malay Writing, Chinese Comprehension, Chinese Writing, English, Mathematics, and Science. I get As for all subjects except Chinese Comprehension (C) and Chinese Writing (B). It looks like I'm better at writing something new rather than understanding existing stuffs. All the subjects mentioned were in the older syllabus, I don't know how it is now. Other than the school I attended to, there are also other schools in my small town, Sungai Lalang.